When successful real estate agent, Melba Burns witnesses a horrible accident, she quits her job and refuses to drive her car again, hoping to save someone else from the death that cars can cause. She retreats to her home and its garden, starts using the bus system to get around, and pushes her wheelbarrow back and forth to the grocery store. As she beings to adjust to this simpler life, she meets JoLee Garry, a woman who's always looking for a good time. Melba takes her in as her roommate, and soon Melba's life takes off in an entirely new direction. 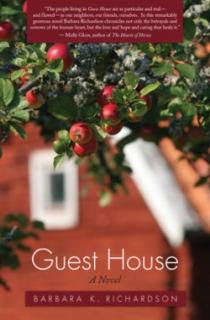 In Guest House , Barbara K. Richardson weaves a story about what brings people together and what tears them apart, what makes a family and what is truly important in life. I absolutely loved this novel, mostly because of the main characters and the way Richardson brings them to life in her writing. There's Melba, 54 years old, successful, seemingly content with her life, who gives up everything to honor a man she never even knew. Then there's Matt, JoLee's 10 year-old son who is stronger than just about all the other adults in the story ~ and often smarter too! And of course, there JoLee and Gene, Matt's parents who know absolutely nothing about parenthood despite ten years of experience. Yet Richardson makes us care for these despicable characters and yearn for them to change, to see the error of their ways. She makes us care for everyone in the story, except perhaps for JoLee's boyfriend, Bill, who really has no redeeming traits whatsoever. Guest House was an wonderful story full of heartbreak and hope. I highly recommend it. This review was written based on a copy of Guest House that I received for review from The Book Report Network.. I'm so glad you liked this one. Thanks for the great review. I turned it down because i had a few others I wanted to read first. Sounds like it was pretty good though!